menu, RS-232 interface and optional software. The PCE-LS series densimeter is attractive due to its high level of accuracy and its functions. It is an exceptional device with its durable cast aluminium enclosure. The graphic display with capacity indicator makes results easy to read. With the optional software application, data can be transferred to a computer by means of the RS-232 interface. If you have only USB port, then you can get a separate RS-232 to USB adaptor. The device has an internal automatic calibration and an external calibration can be performed with optional test weights (only in cases if the densimeter is not verified). The densimeter can also be calibrated in an accredited test laboratory to certify that it meets ISO standards. There is also a variety of other optional accessories for the device. This link shows an overview of other densimeters that will meet your needs. Below you will be able to see the technical specifications of this device. Feel free to contact us and discuss the features of these devices or any other models. Our technical department will be happy to help you. 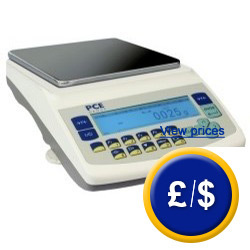 The image above shows the PCE-LS 500 densimeter with a round weighing pan and a small protective cover which is included. 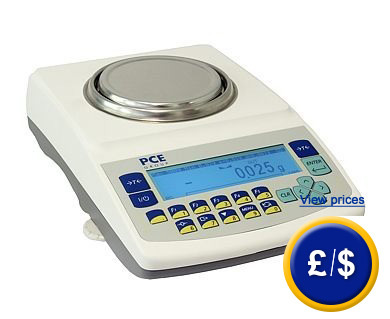 The PCE-LS 3000 has a circular weighing pan. Both pans are made of stainless steel and can be used in all types of laboratory work and research. user selectable piece reference, with changeable piece weight measurement units. - Internal adjustment setting: if the densimeter produces an oscilation of ±1°C or after a period of fixed time, the device makes an automatic adjustment using an internal calibration weight. - Date and time adjustment (requires user specific code for access). - Capacity indicator: a luminous bar shows the available weight range for the densimeter. - Cast aluminium enclosure which is durable and reliable. - Optional calibration certification (to meet the standards such as DIN ISO 9000). Aside from showing a digital representation of the measured weight, the LCD also shows a bar to indicate the remaining range capacity (0 to 100%). This allows the user to check the measurement range. The light intensity of the display backlight can also be adjusted via the keypad. The image above shows the display of the densimeter with backlit illumination off. A verifiable densimeter is used for processing medicine in a chemists as well as for analysis in medical laboratories and pharmaceutical companies. Take into account its wide field of application. We can verify your densimeter for you. a) In commercial transactions where market price is determined by weight. b) For the manufacture of medicine, including analysis in a medical laboratory and pharmaceutical company. c) For determining taxes, tariffs and fines in official cases and judgements. d) For the fabrication of packaging. Each densimeter is tested by the relevant governing body to verify that the device meets retail standards. This is when the accuracy of the device is confirmed to be within the standards. The EU validation extends across all the countries of European Union. With this declaration of conformity we have a written document certifying that the PCE-LS densimeter meets specific properties outlined in the document. This is presented in different languages according to the standards which the densimeter meets. If you click on the image to the right or on the user manual PDF, you can see the declaration. a) Commercial transactions where market price is determined by weight. b) The manufacture of medicine, including analysis in a medical laboratory and pharmaceutical company. c) Determining taxes, tariffs and fines in official cases and judgements. d) The fabrication of packaging. Each densimeter can be reviewed by the Calibration Office. This will ensure that the device is functioning accurately within a specified range of tolerance that is permitted. This confirms its accuracy within the calibration tolerance The EU validation extends on all countries of the European Union. Calibration of the densimeter with the CAL adjust programme: the programme will be identified by an official mark after the first calibration. The calibration will be valid for a given period of time. This will require to include the postcode of the organization to facilitate the calibration. Depending on the model, this calibration can be done by the manufacturer or on the site. Calibration of a densimeter by adjustment or automatic change: There are no limits for using device on the site, as the automatic calibration can be done when required after the initial calibration. Calibration value: measured as the tolerance of calibration, almost always between 1 and 10 days. 1 x PCE-LS verifiable densimeter (model PCE-LS 500 or PCE-LS 3000), 1 x mains adaptor (230V/12 V) and user manual. This software application will allow to transfer data to a computer via the RS-232 connector. It will also include time and date to allow data to be documented correctly on a computer. Data can also be exported to other programmes such as Excel. If your computer has only USB port, then the corresponding adaptor should be used. RS-232 cable is included with the software application. This adaptor will permit you to connect the densimeter to USB port. To print data results directly from the device, to document weights in a laboratory. It comes with RS 232 connector and 240 V mains adaptor. The paper is 112 mm wide. Calibration of this type of densimeter can only be done by an official organization which has authorization to perform this task. Once this is done, an annual recalibration will not be required using an external calibration weight. The first calibration is valid for two years, after which the device will need to be recalibrated annually. For companies that wish to include the thickness meter as one of their internal tools or for annual recalibrations. The ISO certification includes a laboratory calibration and a document with all the measurement values. This device is used for determining the density of solids. It uses the hydrostatic principal. Density is the relation of the weight [g] and volume [cm³]. Weight is determined by weighing the test material in the air. Volume is determined by testing the material while it is submerged in liquid. (class EII, 100 or 200 g according to OIML) This can only be used to recalibrate the densimeter in situ and to allow quick testing of the devices accuracy.